What is “let’s encrypt” ? Let’s encrypt is a trusted certificate authority, that provides the possiblity to automatically generate free certificates since september 2015. Mozilla foundation, Electronic Frontier Foundation and University of Michigan cooperate to create the ISRG (Internet Security Research Group) that provides the Let’s encrypt service. Without going into too much detail, a certificate allows a safe access to internet sites. In short, it can get information on x.509 standard on which HTTPS, SSL and TLS are based. The main problem is that before the existence of let’s encrypt, it was necessary to purchase an expensive trusted certificate . How does let’s encrypt generate free certificates ? Let’s encrypt has automated the human operation of verification, that is to say the verification that the person who asks for the certificate owns the site, server or domain. This is the ACME protocol. Before, the people aware of the security problems created their own selfsigned certificates. Unfortunately the warnings of browsers were discouraging any user to move forward into the website. Considering the disadvantages most sites didn’t propose a secure access. What are the disadvantages of let’s encrypt ? The certificates delivered by let’s encrypt are applicable only 90 days forcing the renewal automation, but renewal automation is quite easy, we will see how to do it at the end of this article. Certbot is the official client to request let’s encrypt for a certificate. For the automatic renewal, certbot has many commands. 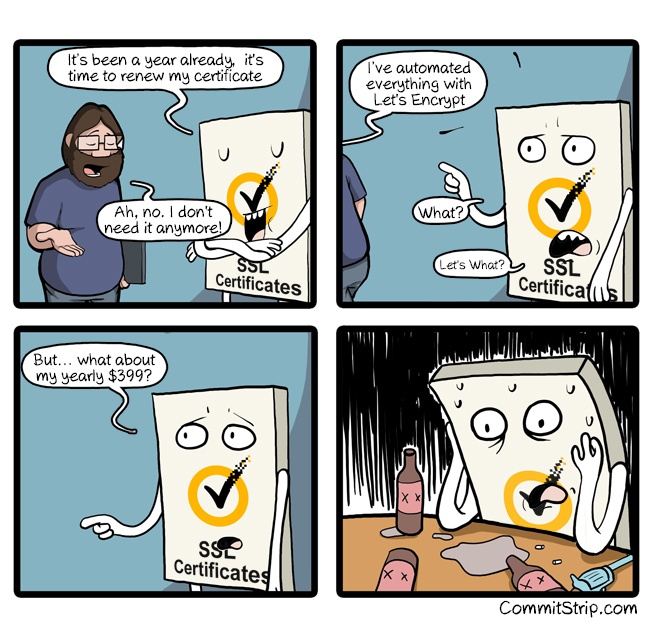 simulate a request for a renewed certificate, it uses parameters of the actual certificate. in a cron task or a system command. The goal of let’s encrypt set out encrypt 100% of the web. There is no doubt that with their sponsor and their growth they are on the good way.